Lizard Point, is Britain's most southerly point. The area is famous for its dramatic cliff walks, wild flowers and geological features, including the local Serpentine Rock. The point is a spectacular location with steep cliffs and stunning views. Sit in the Polpeor Cafe , where for the price of a cup of coffee, you can enjoy the amazing setting on Lizard Point and the Life Boat station that shelters at the foot of the cliffs many feet below. 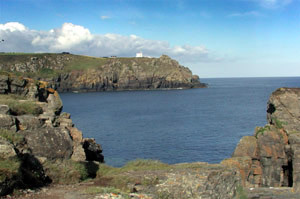 The Lizard peninsula derives its curious name from the old Cornish "Lis-ardh", meaning fortress. The Lizard Peninsula is a notorious stretch of coastline that has been the site of many disasters at sea. At short walk to the East, towards Housel Bay, will take you to the Lizard Lighthouse - built in 1751 and operated by Trinity House since 1771 -the Lighthouse is open to the public and again offer magnificent views. An earlier lighthouse, established by Sir John Killigrew in 1619, was decommissioned and demolished because ship owners were reluctant to pay a toll for its maintenance. The Lizard is well known for its wildlife. But the Cornish Chough, is the star attraction. Careful land management and a controlled reintroduction means that the Chough has become a regular sight in the area after many years of near extinction in Cornwall. The Chough (Pyrrhocorax pyrrhocorax) is a member of the crow family and has a red beak and legs. the Chough has an excitable, high-pitched 'chi-ow' call from which its name is derived. It is extremely acrobatic bird with a truly impressive tumbling display. The inclusion of the Chough in Cornwall's coat of arms along with the miner and the fisherman, reflects the Chough's importance in Cornish culture. Two miles north of lizard poin,t lies Kynance Cove, considered one of the most beautiful beaches in the world. 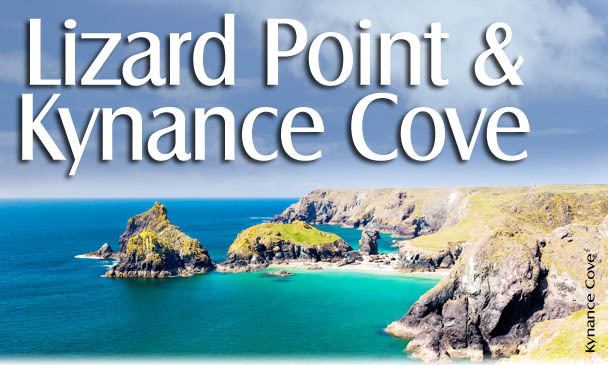 Note: Kynance car park WCs closed in winter (Cove WCs open all year). Be aware that the area has some dangerous and sheer cliffs. Kynance Cove is a very special and unique place to the Lizard Point,- probably the most painted and photographed place in Cornwall. Since the eighteenth century, romantic poets and painters have immortalised Kynance Cove the "perfect cove" due to the brilliant turquoise water and white sands, - islands, caves and unexpected views. Kynance Cove is under the stuardship of the National Trust, who have renovated and improved access to the area and the small Kynance Caf�. CADGWITH - Miniscule fishing village on east coast of Lizard Peninsula. Two small shingle beaches, and cluster of pastel-washed thatched cottages. Fleet once landed 1,798,000 pilchards over four days in 1904. Devil's Frying Pan collapsed sea cave. COVERACK - Unspoiled fishing village, with miniscule quay and traditional cottages spilling down to sea. 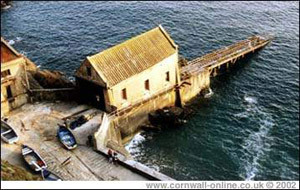 For many years an RNLI station, because of proximity to feared Manacles reef. GOONHILLY DOWNS - Notable for its British Telecom Satellite Earth Station (note that the BT visitors' centre has been closed), prehistoric monuments and barrows, and national nature reserve of 103 acres, habitat of rare heathers. Wind farm. GUNWALLOE - Charming cove to west of Lizard Peninsula, adjoining Church Cove where St Winwalloe church overlooks beach. Separate bell tower. First transatlantic radio signals transmitted by Marconi from Poldhu Point monument. GWEEK - Formerly a busy port at head of Helford River. Now picturesque village with maritime antiquities, boatyards, crafts and popular Seal Sanctuary with underwater observatory. HELFORD - Picture postcard village on Helford River and yachtsman's haven. Daphne du Maurier's Frenchman's Creek to west. Beauty and solitude. 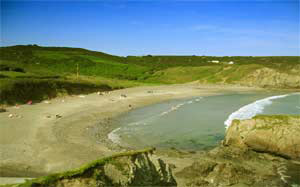 KENNACK SANDS - Popular beach, south-east Lizard Peninsula. Ruins of Poltesco serpentine stone factory worth visiting at nearby Carleon Cove (NT). KYNANCE COVE - Famed beauty spot north-east of Lizard village. Sheltered sandy coves and caves at low tide. Steep path from clifftop car park (NT). LIZARD VILLAGE - Serpentine rock gift shops clustered around village green. Walks to lighthouse, lifeboat station, mainland Britain's southernmost point. MAWNAN SMITH - 13th century church at head of Helford estuary. Three outstanding gardens: Penjerrick, Trebah and Glendurgan (NT). Fishing hamlet of Durgan (NT) nearby. Good walks in all directions. MULLION - Close-knit village, interesting church with carved bench-ends, standing above sturdy harbour of Porth Mellin (NT). Excellent walking. Marconi monument at Poldhu Cove. PORTHALLOW & PORTHOUSTOCK - Secluded shingle coves, notable for angling and diving, on east of Lizard. Close to Manacles reef. PORTHLEVEN - Pleasant harbour town, developed last century, still a working port. 3-section harbour with wooden baulks lowered against storms. Loe Bar & Pool, Penrose Estate worth exploring on foot. PRAA SANDS - Mile-long family beach on Mount's Bay. Golf course. Walks to clifftop mine houses at Rinsey Poldark Christmas Special 1995 filmed here. ST KEVERNE - Pleasant village with square on Lizard Peninsula. 400 shipwreck victims of nearby Manacles Reef buried in churchyard. The birthplace of two Cornish rebellions. Annual Ox Roast in August. Beaches at Porthallow, Housel Bay and Kennack Sands. Nature trails at Tregellast Barton farm.